Modern meeting venues rewarding business at Anantara Angkor Resort. 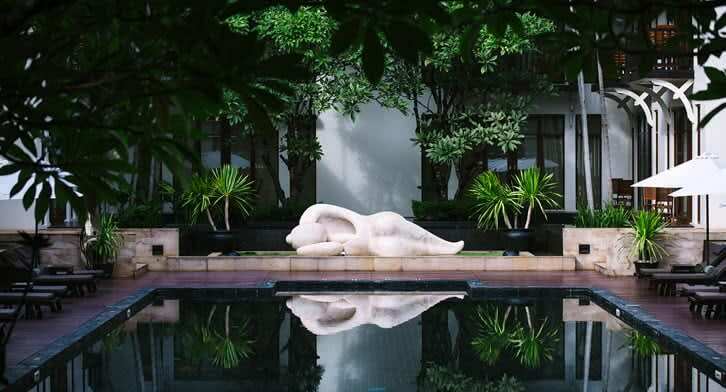 Located just minutes from Siem Reap International Airport, and with a quiet boutique setting, Anantara Angkor boasts the best meeting venues in Siem Reap. It plays host to high-end corporate retreats and special interest incentive groups. Our versatile meeting spaces, both indoors and out, are ideal for workshops, team-building, and celebratory banquets. Customise your event with our dedicated meeting planner. An elegant space with teak wood floors, large windows allowing plenty of natural light, and a spectacular high ceiling. A full complement of audiovisual aids is on hand. Overlooking the courtyard garden, with natural light, indoor-outdoor flow, and an adjacent terrace for coffee breaks. Designed with privacy in mind, the Conference Room’s elegant interiors provide the perfect setting for board meetings or executive lunches. Landscaped gardens are accented by cascading water features, an ideal ambience for cocktails and celebrations. This oasis of tranquillity is ideal for all types of gatherings, day or night. A loft space overlooking the central courtyard, perfect for informal gatherings.